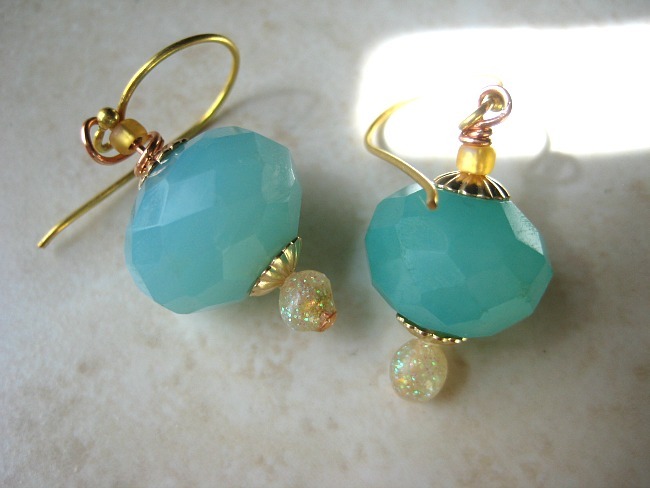 Want to learn how to make your own headpins for earrings? I recommend this DIY tutorial using old eye make up, a heat gun and glitter. 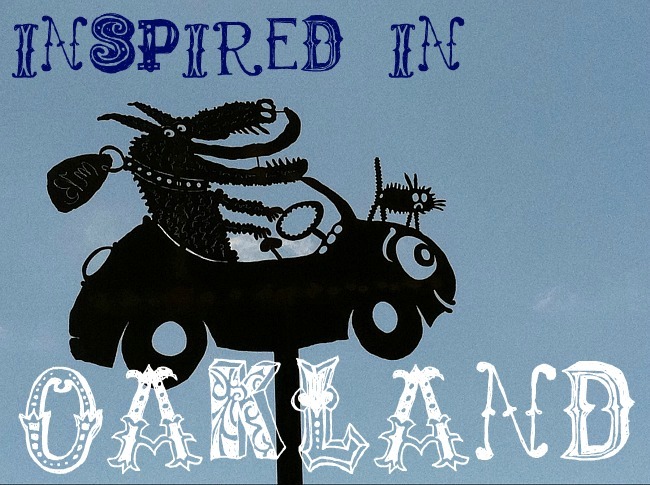 Part of my creative meanderings lately, have been exploring new media- new for me anyway. 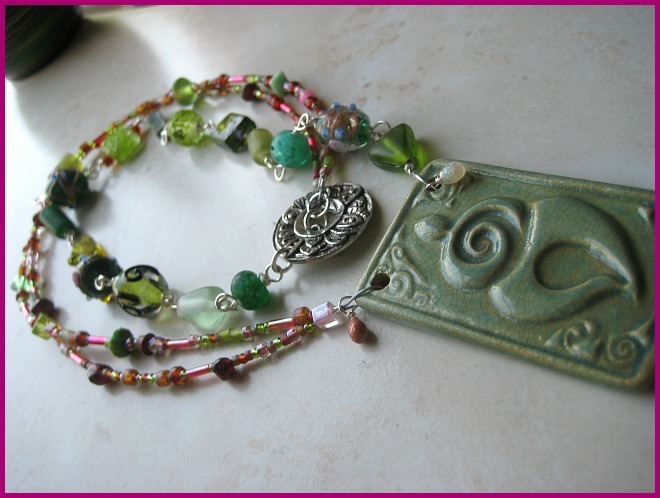 I normally buy finished pendants and findings (toggles, clasps, headpins for earrings, etc. 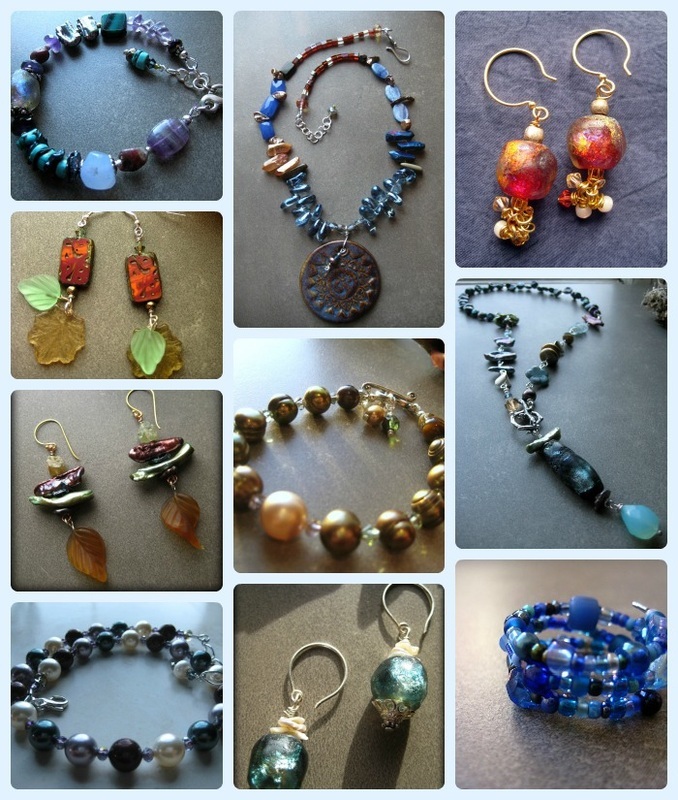 ), and spend my time on stringing and wire wrap. 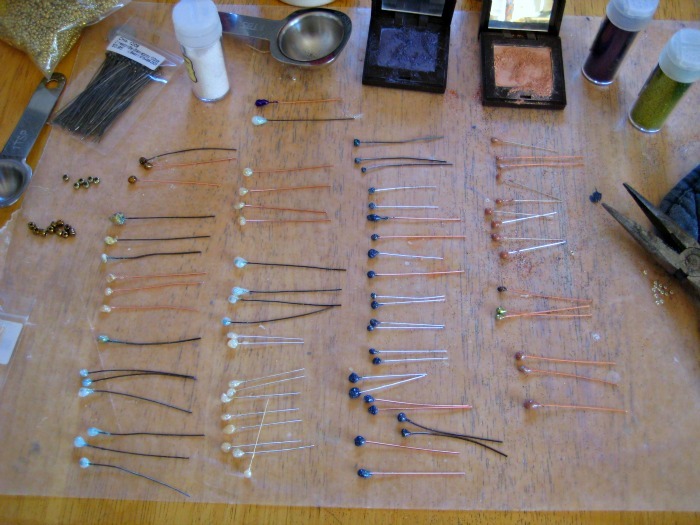 But certain tutorials have given me the nerve to try my hand on findings, like this one on making headpins from Marina of fancifuldevices. I love this one because clever girl that she is, Marina combines household items (old make up!) with inexpensive supplies most beaders have at home. First, let me begin where I ended: my ruined kitchen table. First advice; buy a protective surface for your work space and creative projects: don’t work directly on your furniture. Silly me, I thought wax paper and paper towels would suffice. Have since gone to the hardware store for a plastic rollout surface, and friend G suggests an oversized cutting board- which works great when you have to move your project round dinner time. (NOTE: we will know if Esposo actually reads this blog because I have yet to fess up to the mystery of missing veneer and burn stains on the southwest corner. (Bad grrrrrl! Ha!) 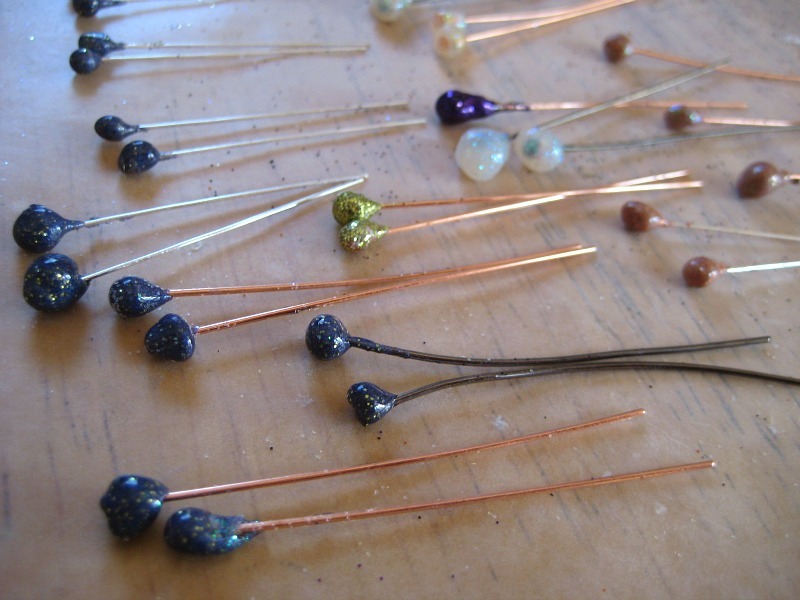 But here is the good news… Lots of cool, headpins- Yippee! This is exciting because so many of my crafting/embellishing forays are grand flops; I can’t even blog about them, they are so stupendous. So pardon the gush: I am extremely happy with the results. I learned an alternate use for embossing enamel (UTEE) + heat gun + eye powder & glitter. I just followed the directions in Ms. Fanci’s tut. 1) Eyeshadow colors turn out darker- even when I didn’t use a lot of heat. I was actually hoping that the cool periwinkle color would stay that way, but I got this indigo instead. 2) Work fast; going for the rounded shape was the hardest thing. Trying to get that teardrop must be an art, one that I will be happily working on! 3) You can easily darken colors with the heat gun with a second pass; going for shape the first pass gave me better results. Overheating mos def darkens the colors. (Although check out all the different hues you can get with different temperatures. Believe it or not, these are all from just clear UTEE with the same fine glitter. The clear ones are glittery because I added a white/clear glitter to clear UTEE, sans eyeshadow. I like how lots of heat turned them golden! 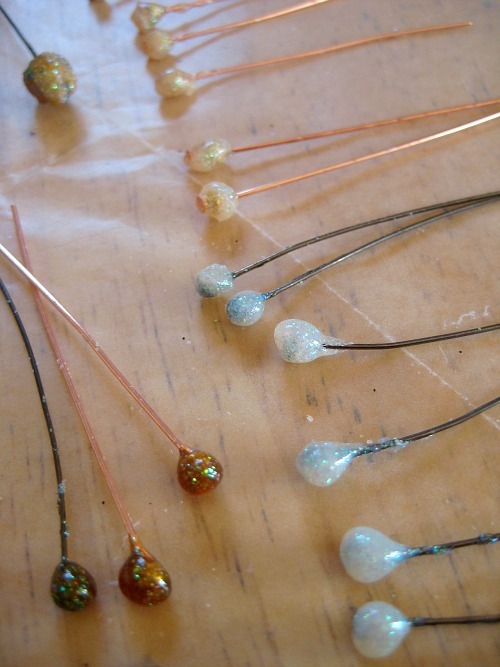 4) Dipping the teardrop in glitter at the tail end is a very cool effect (second pic with bright purple and green). Don’t overheat though; today’s glitters are plastic and will torch up. these look friggin AMAZING and i want them in my grubby hands now. did i not warn you to protect the surface on the tute? thought i did. sorry bout that. its true that utee darkens with heat, but i’ve never gotten such drastic color results. maybe i never heated it as much as you did. the more you do the easier and faster you get. the opal glitters look insane. i want them! for me! gimme. er, i mean, what glitter did you use so i can make them? The opal-esque glitters are just the white/clear looking ones, labeled ‘fine’ as in size. They come in the multi-colored packs at Michaels. So inspirational!! I also bought the tute, but still haven’t tried making the headpins! About time I do! Your’s turned out beautifully!